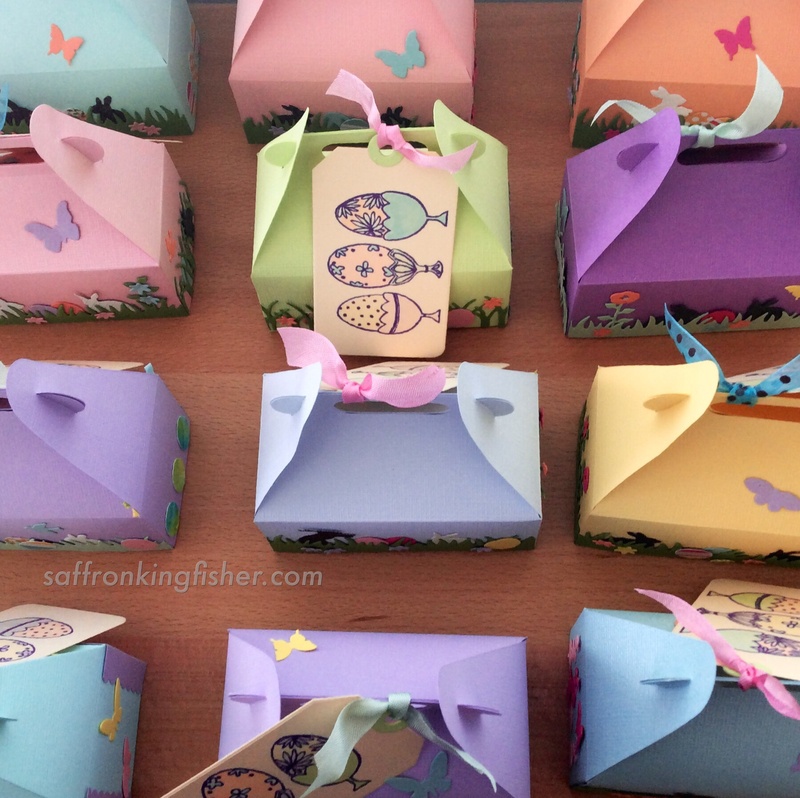 I was inspired by an amazing diorama on Kittie Kraft to make these sweet little treats for Easter. As I was mass-producing and mailing these, I made my scenes a little simpler but you can go as detailed as you like. 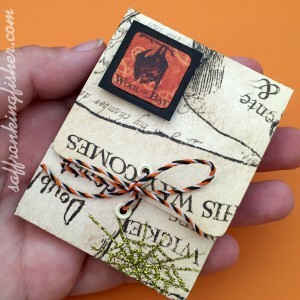 I die-cut a small gable box as my base (specifically the Sizzix Carry-all Bigz XL, but Papertrey Ink, Clear & Simple Stamps and I sure other companies have similar dies), but the Treat Bag or the Candy Box from Lawn Fawn would look totally cute decorated in this way as well. 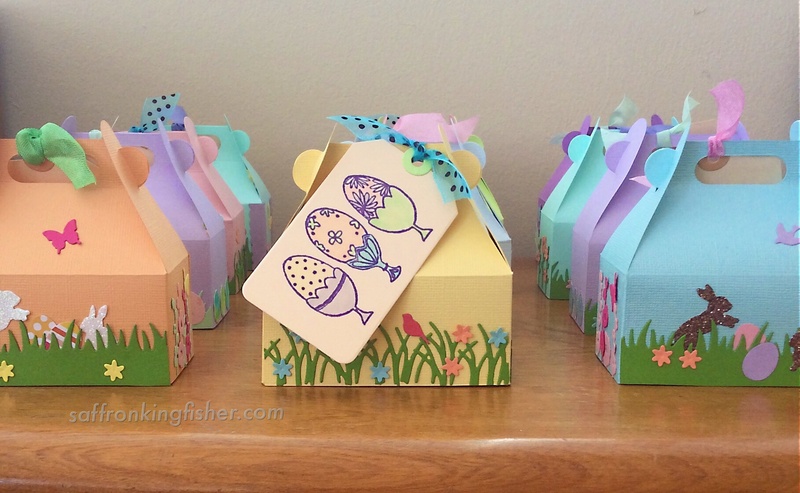 I cut out and assembled my boxes before decorating, using different pastel shades of 12 x 12″ Bazzil paper. I found that Sookwang tape (aka Scor-Tape) was the best adhesive for assembling these boxes: no mess and holds tight! 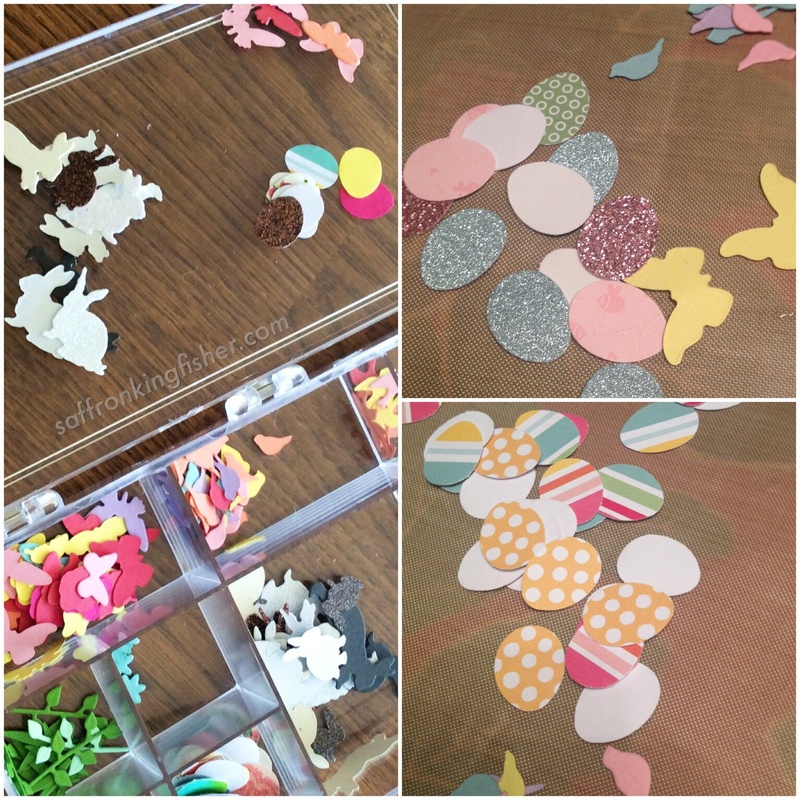 Next, I got to die cutting: bunnies, grass, flowers, eggs, butterflies and birds. I used dies from Impression Obsession, Lawn Fawn, and a tiny EK success punch for the eggs. Glitter paper made for sparkly chocolate bunnies. 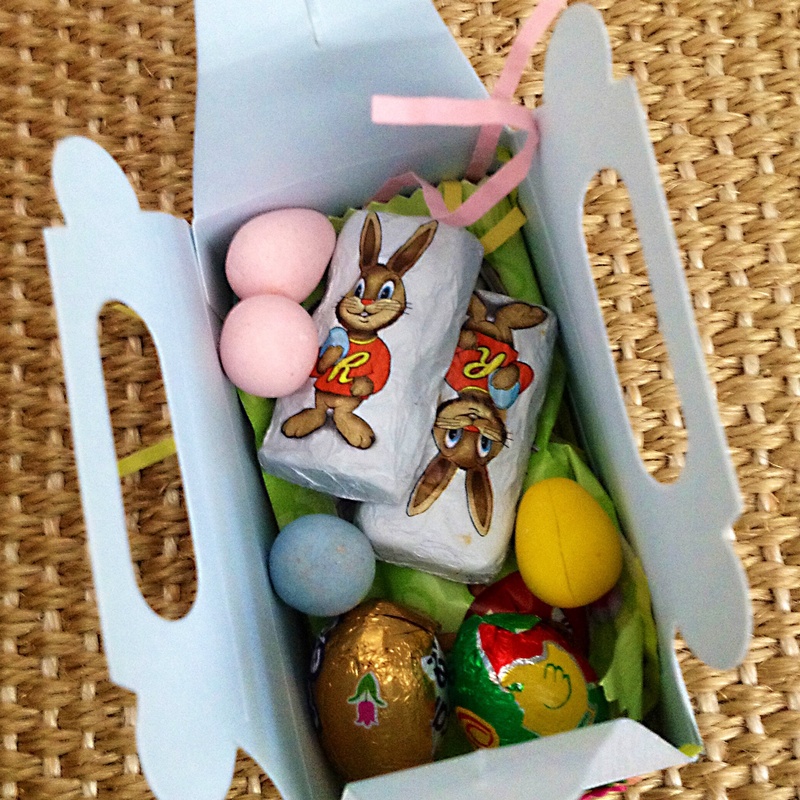 Patterened paper became already-decorated easter eggs. I glued the components of each scene onto the sides of the boxes, and trimmed any overhanging grass or leaves. 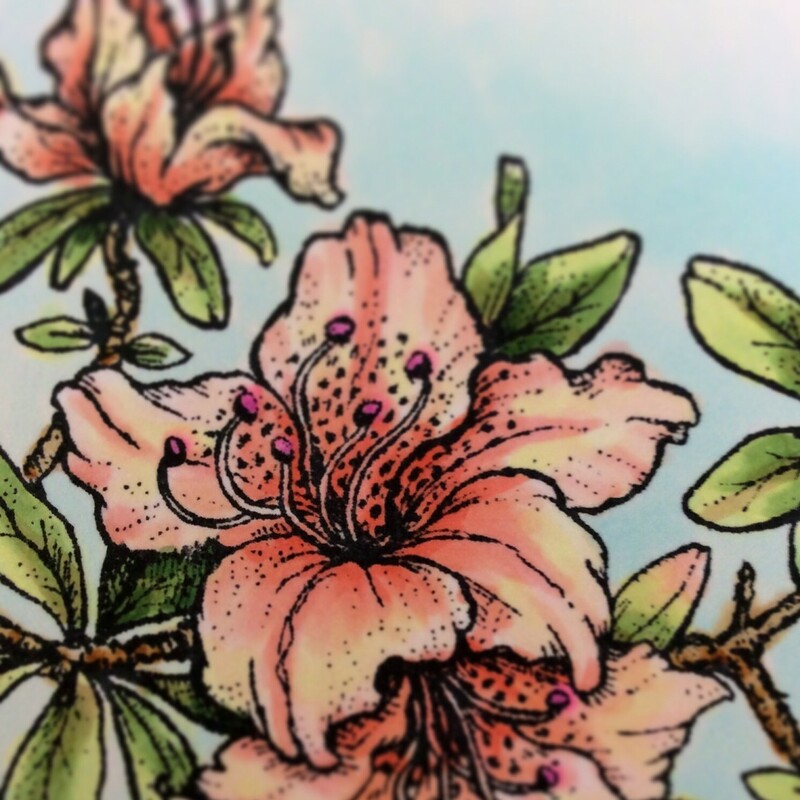 I found that Glossy Accents held well, and even the tiny flowers stayed on through the mail. For tiny pieces, I applied the glue with a toothpick. 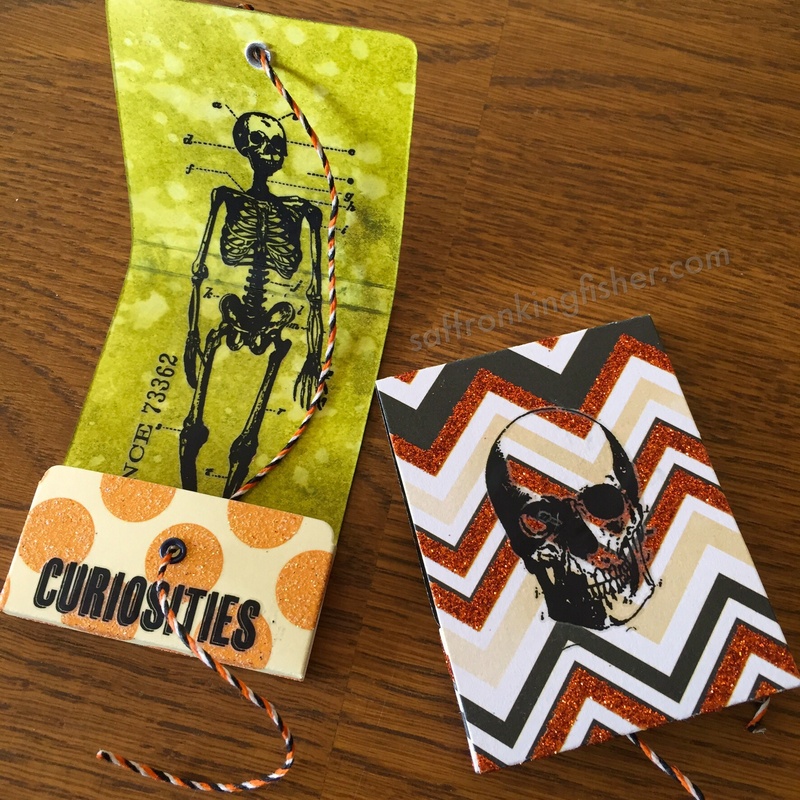 The large tags were cut from the Lawn Fawn Tag You’re It die, and attached with vintage seam binding. The stamp is from my LSS Paper Tales. 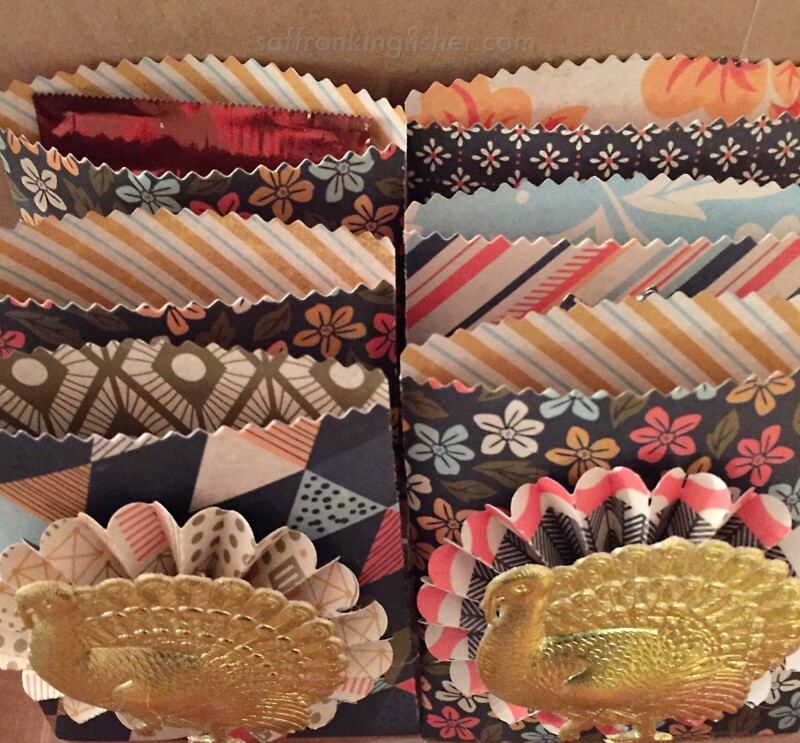 It seems like I just finished making Halloween candy boxes, and now I’m making these darling little treat bags for my in-laws’ Thanksgiving open house. 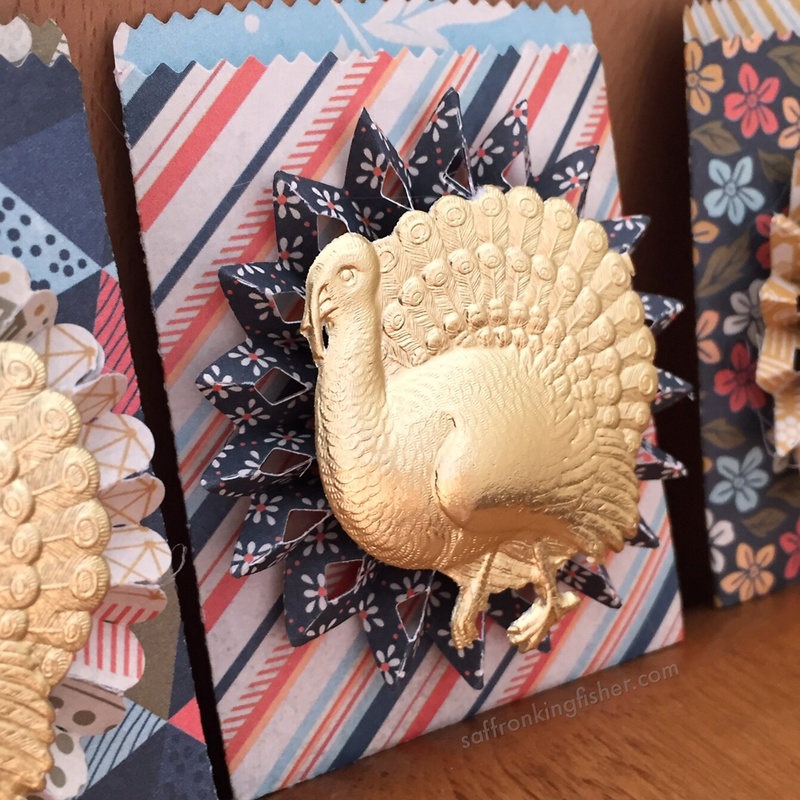 They’re relatively simple to make: just a couple of dies, patterned paper and some foiled Dresden turkeys. And hot glue – can’t forget the hot glue! 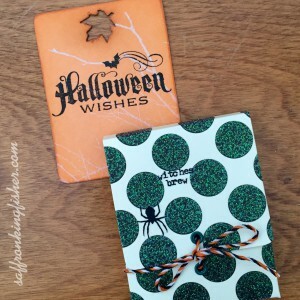 I chose double-sided paper from Basic Grey’s Persimmon collection. 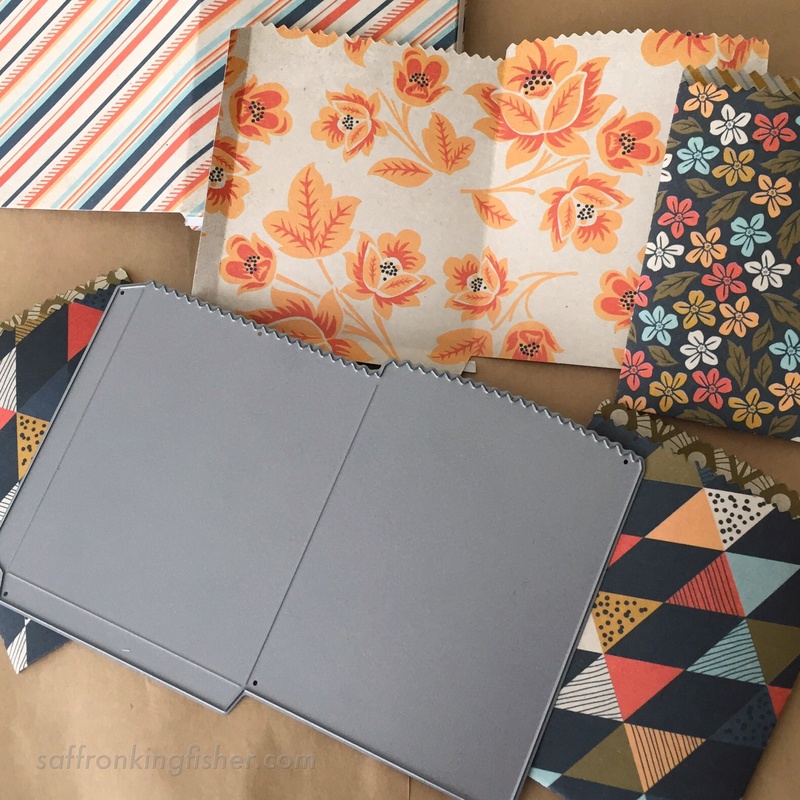 This might be my very favorite autumnal collection of papers, as I find navy and orange to be such a sharp color combination, and I love that the prints range from vintage flowers, to bold stripes and tribal designs. 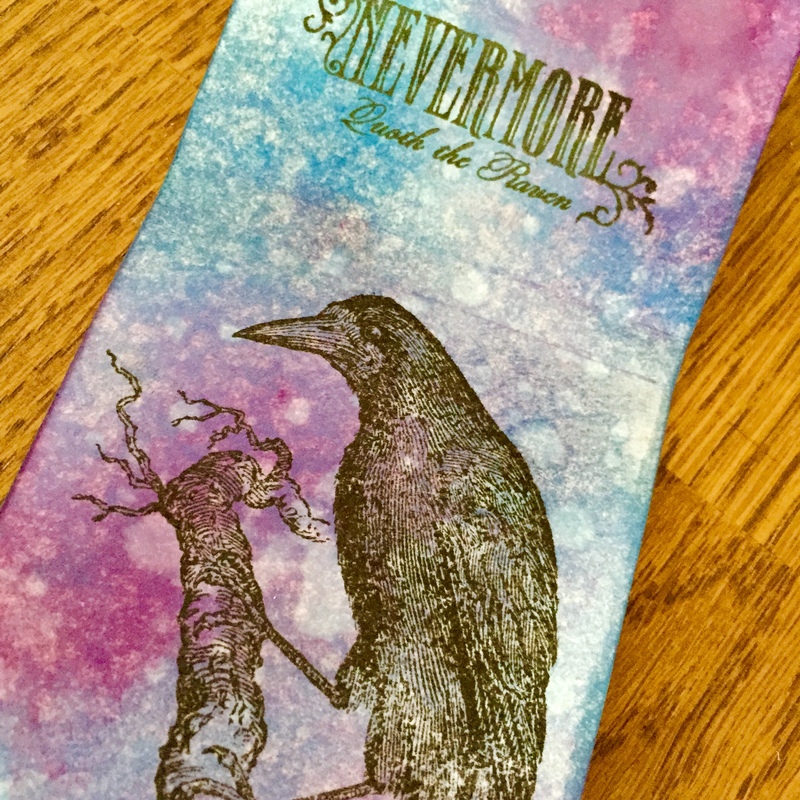 I happily mixed and matched patterns, and really like that the design of the die allows for a glimpse of the inside paper pattern at the top of the bag. I’m using the Deco Bag Dies by Paper Smooches for my base. I recommend using Scor-tape to hold it together, as you’ll want a strong adhesive. Be sure to line up the edges of the bags carefully, because the die is designed to make a slightly roomier shape than a flat pocket. 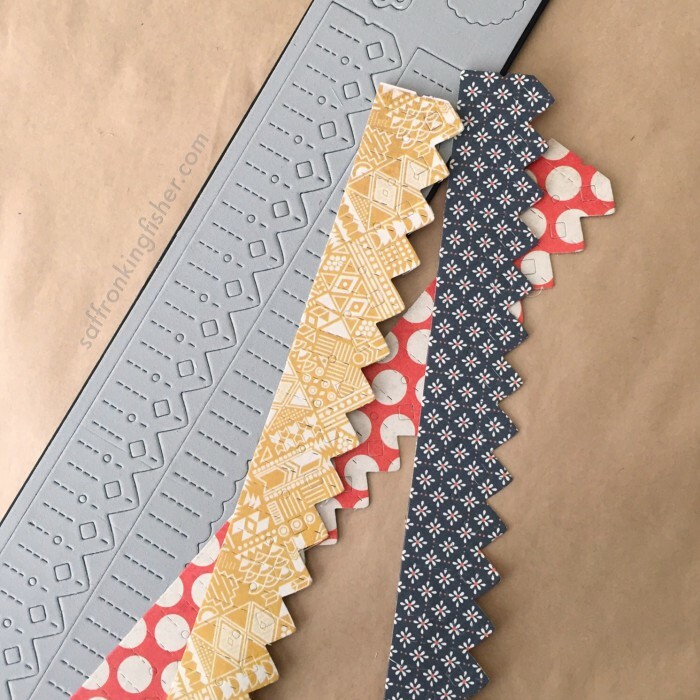 The medallions are cut from the Sizzix Brenda Walton Medallions Decorative Strip Die and the Sizzix Mini Paper Rosettes die. If you choose to use the lacier Brenda Walton medallion, don’t bother punching out all of the little holes. Just start folding along the score lines and most (if not all) of the little bits should fall right out. You’ll need hot glue to assemble the rosettes, and you can adjust the size depending on how tight you make the centers. 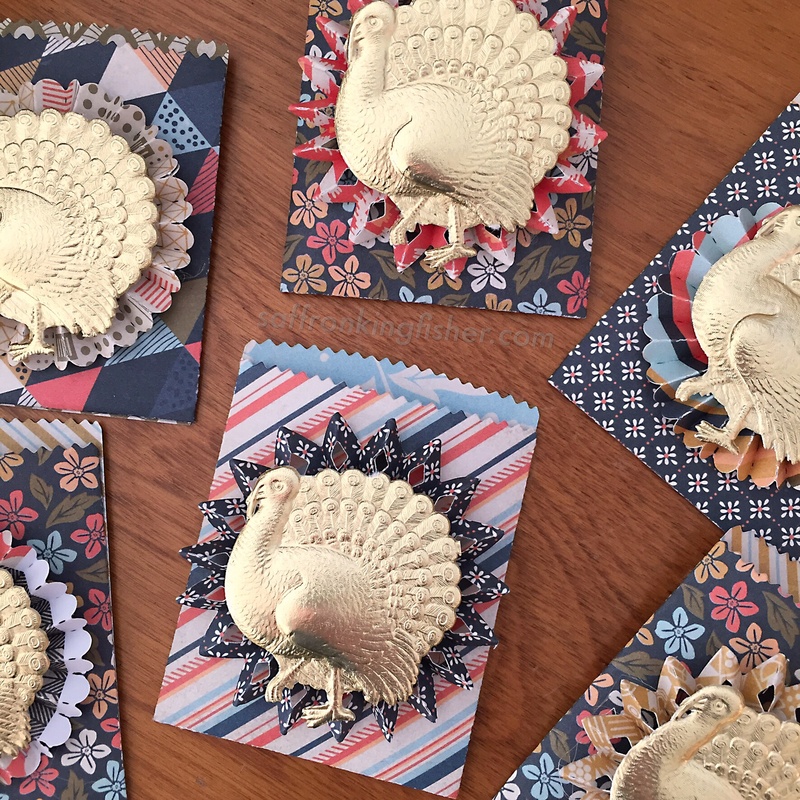 I found my foiled turkeys on etsy, but blumchen.com is a great source for all sorts of Dresden trims and shapes. 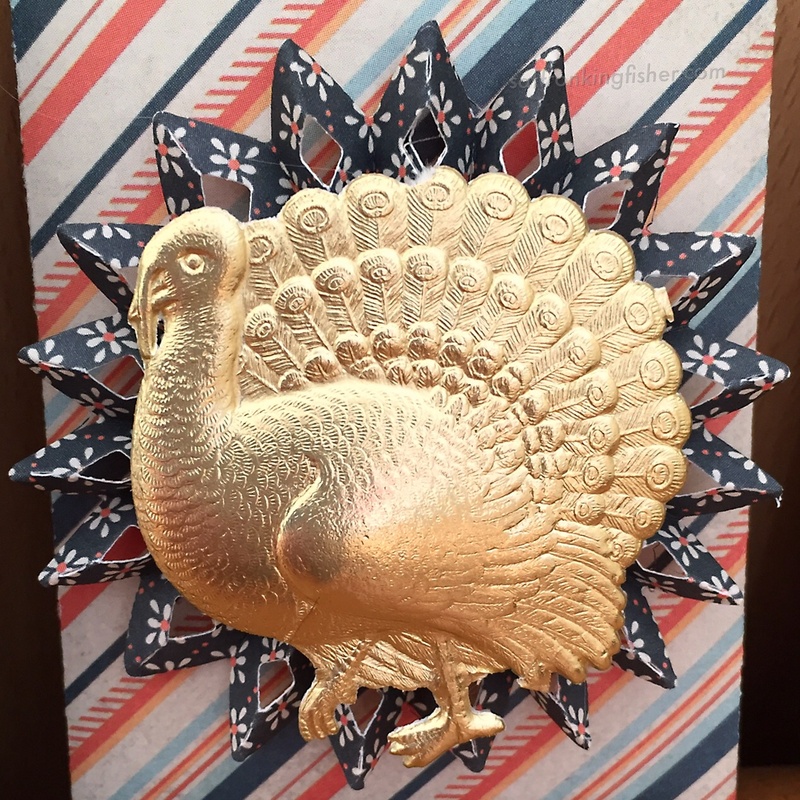 The turkeys were hot glued to the medallions and then the medallions were hot glued to the bags. Each bag will hold one Ghiradelli square, my favorite kind of treat! 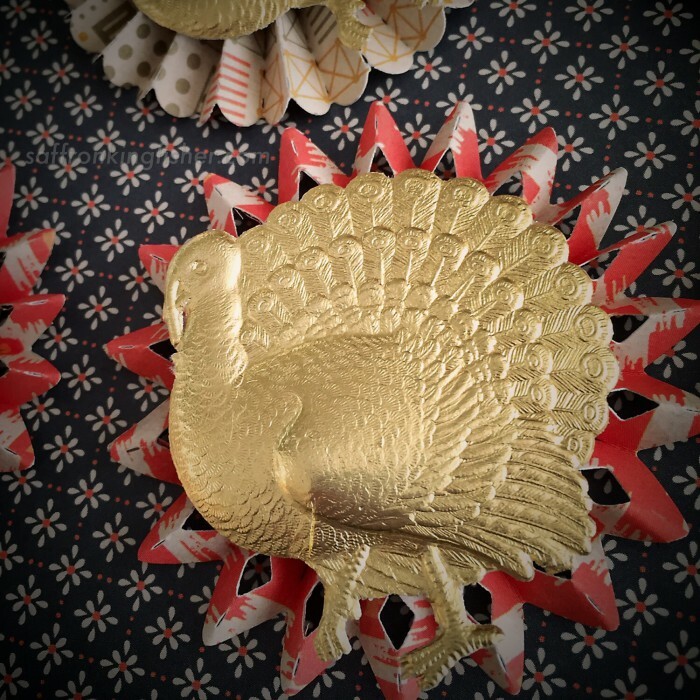 Instead of turkeys, you can die-cut label shapes for the center of the medallions to create fun place cards. 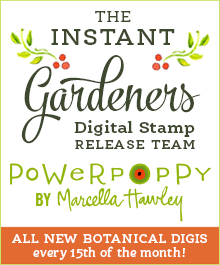 I bet gold heat-embossed leaf or feather designs would look wonderful too. 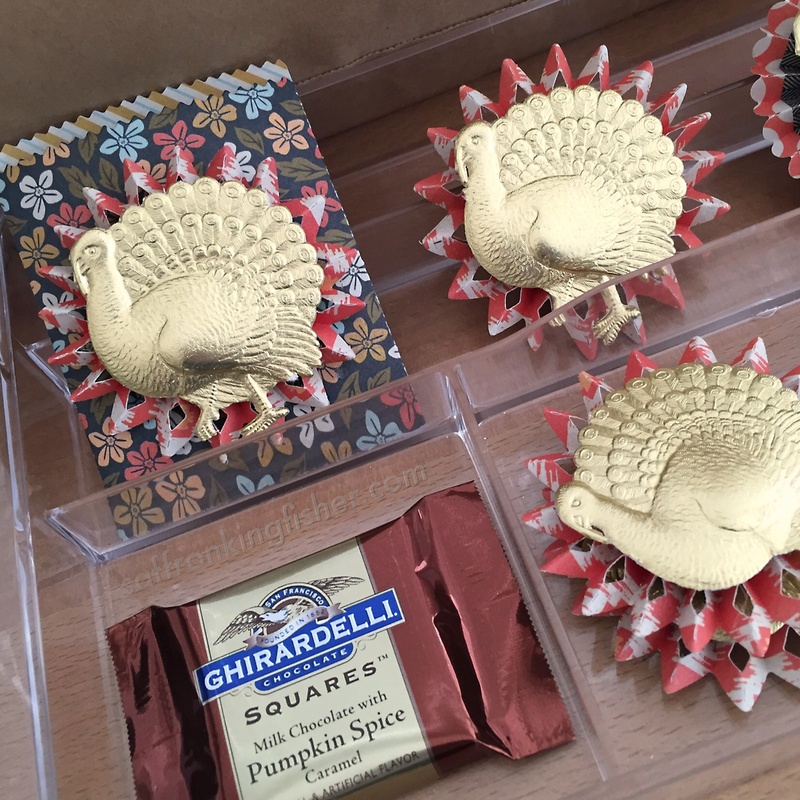 I’ve made an exciting discovery: the Sizzix Matchbook Notebook die makes a box that’s the perfect fit for a Ghirardelli square! 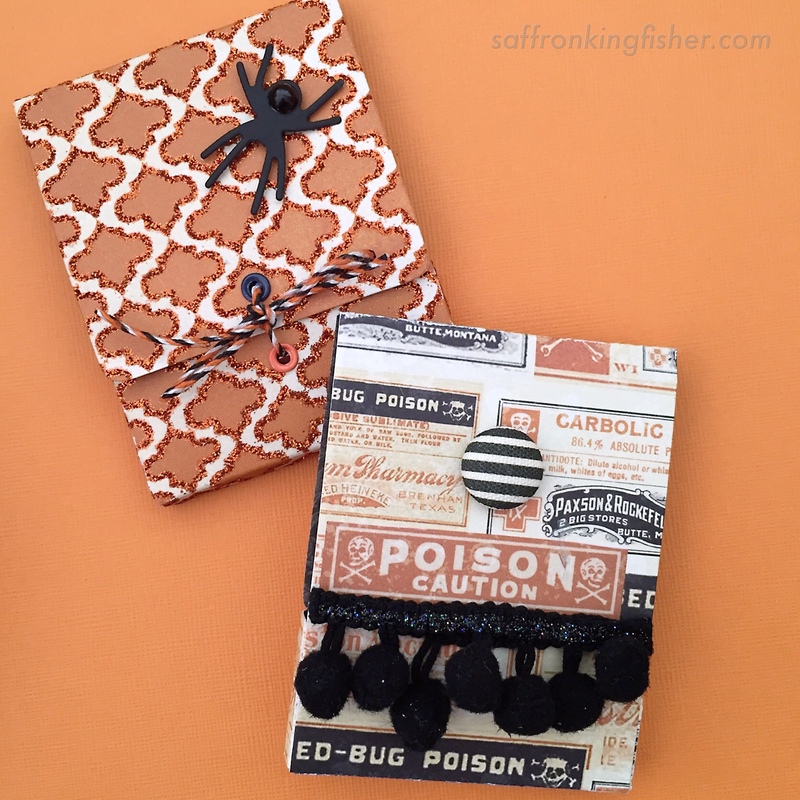 I immediately gathered halloween papers and trims and set to creating. I really got a lot of use out of my Tim Holtz rub-ons. 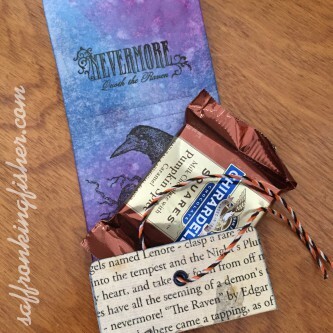 I like adding some spooky words and phrases to make sure the recipient knows that this is a scary treat. To close the boxes, I attached eyelets and then tied a bow with some Lawn Fawn twine. 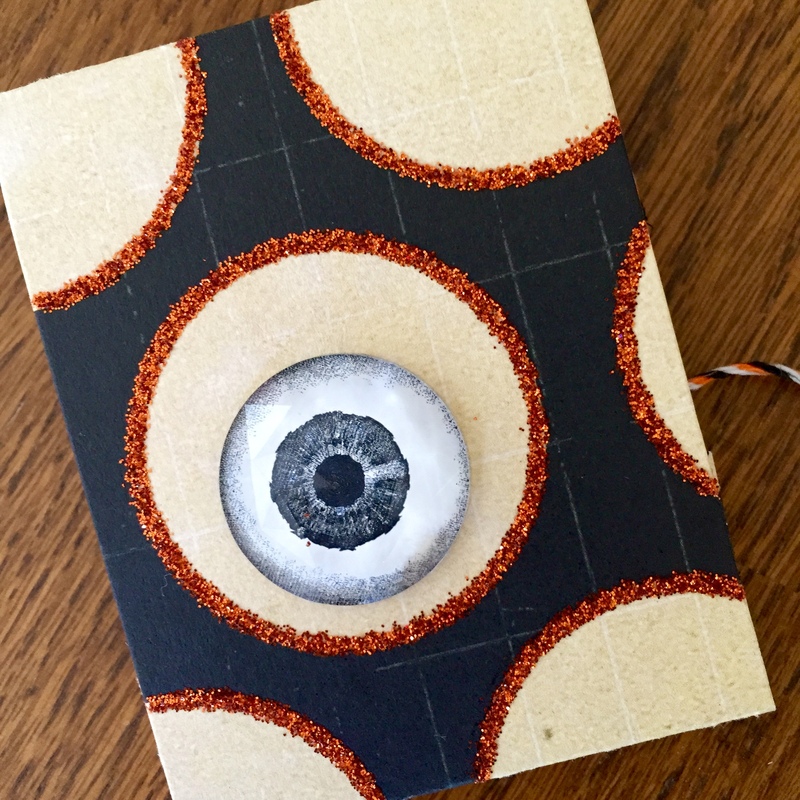 I’ve been waiting for a reason to use this 3D eyeball! I actually hate siders, but put fear aside to decorate one box. Maybe the “Poison” box will provide the bug spray?? 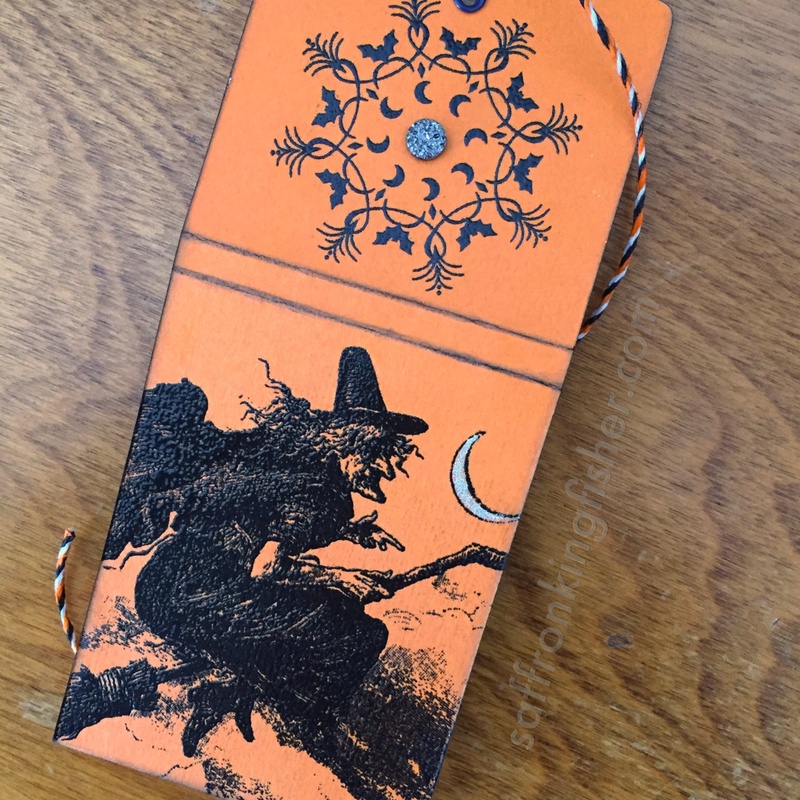 Here’s a wicked witch, stamped and heat-embossed on plain card stock. Stamps are by Waltzingmouse. My favorite “inside” decoration. The background is Distress ink. Ghirardelli makes a Pumpkin Spice Caramel square (delicious, btw) that would be seasonally appropriate, but any flavor square would make a nice “grown-up” treat for a friend.